A delicious and easy-to-make family dinner. Try it tonight! 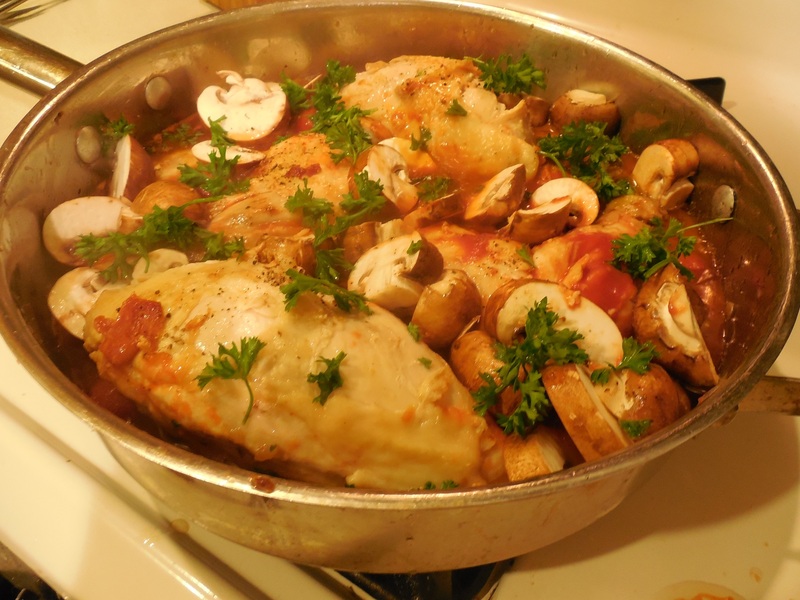 Try One-Pot Italian Chicken Cacciatore for YOUR Italian Dinner Tonight! Rinse the frying chicken inside and out, pat dry, and cut into pieces. Reserve the back for chicken soup to be made at a later date! Sprinkle chicken lightly with salt and freshly ground black pepper. Pour olive oil into your pot or skillet to coat the entire bottom of the pot with a thin layer of oil, using approximately 1/4 cup of olive oil. Add 1 of the cloves of crushed garlic and cook under low heat until it softens and adds flavor to the olive oil, but do not brown. Remove garlic. Raise heat to medium high. When the oil has heated, add chicken to the pan skin side down, keeping each piece separate from the other. Let cook without moving the chicken for a few minutes. Lift up one of the chicken pieces gently to check. When the skin has browned lightly, turn chicken pieces once and cook about 5 minutes more. Remove the chicken to a plate. Pour off any rendered chicken fat and a couple more tablespoons of olive oil so pan is coated lightly. Add the second piece of crushed garlic, the onions, and the peppers and sauté until all vegetables have softened a bit but have not cooked. Add the white wine and boil off about 1/2 of the wine. While the wine is boiling, use a wooden spoon to scrape off any browned bits that have stuck to the pan while the chicken was browning. Add the chopped tomatoes with their juices, bundled fresh parsley stems and optional sliced mushrooms. Then add a few pinches of salt and a few grinds of pepper. Add enough chicken stock or water to almost cover the chicken and vegetables. Browned chicken with vegetables and Marsala wine cooking on the stove top. Test the chicken to make sure it is cooked through by cutting a slit into one of the breasts. When the chicken is done, the juices should run clear. Just before the chicken is cooked through, you may want to uncover to boil off any excess liquid. 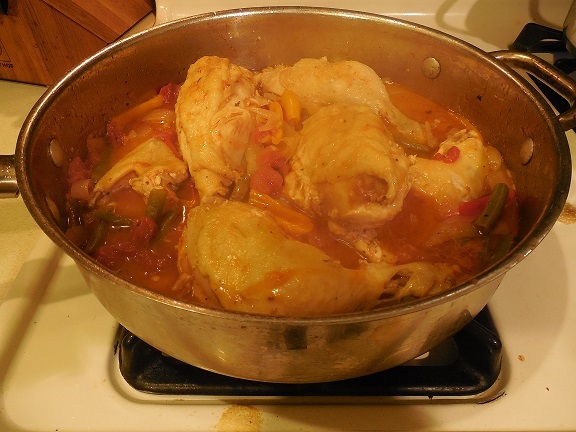 Chicken Cacciatore simmering on the stove top. This dish is not quite a chicken stew,** and the “sauce” it yields will usually be a bit thin, because we have not added flour as a thickener. Taste the sauce, and adjust salt and pepper before serving. Remove the parsley stems. Place the chicken pieces on a large platter or on individual plates. Garnish with fresh parsley leaves. The “sauce” can be served over the chicken and the dish eaten accompanied by bread, like a stew. But as I’ve noted above, I have to admit that here in America, my family breaks the “pasta first course and meat second course” rule and serves this chicken dish together with pasta. I think that this dish is a great way to introduce children to how delicious fresh vegetables can be. But only put grated Parmesan cheese on your pasta—not the chicken, please! With this method, the chicken can be cooked on the stove top, with a large, deep skillet, or started on the stove top and finished in the oven with an oven-safe pot. Put 1/4 cup olive oil, crushed garlic, sliced onions, sliced peppers, tomatoes and their juices, optional sliced mushrooms, and parsley stalks into your cooking pot of choice. Sprinkle with salt. Place the chicken, washed, patted dry, and sprinkled with salt and pepper, on top of the vegetables. Cook on stove top over high heat to bring the liquid to a boil, then reduce heat and simmer, on the stove top or in the oven at 350° until done, about 40–60 minutes. Turn chicken and mix vegetables so all remain in liquid every 15 minutes or so while the chicken is cooking. Add more liquid as necessary. When the chicken is cut with a knife, the juices should be clear when the chicken is cooked through to the proper temperature. Plate chicken and vegetables in their juices and serve with bread or pasta on the side, as given in the first method. 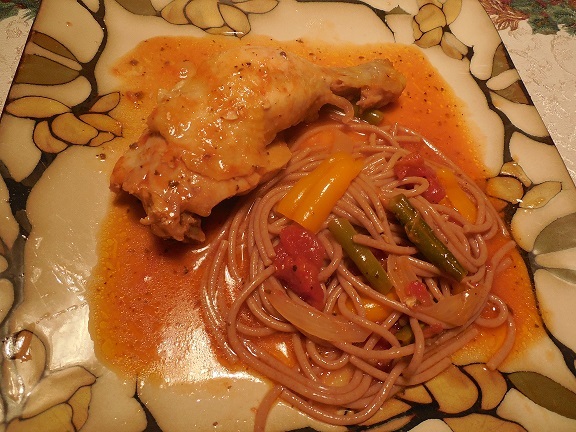 Chicken Cacciatore served with pasta and sauce from the pot. **In a stew meat is cut up, sautéed, and braised, with flour as a thickener. In this recipe, we use a generous amount of healthy olive oil. If you want to decrease the amount of fat, the same methods can be followed with skinless, bone-in chicken, browned for a shorter time initially.